If a disaster were to hit today, would you be ready? Could you, your family, and property survive? Are you prepared? What would you do? Where would you go? These are the basic questions everyone is faced with when a flood, hurricane, or any other disaster that could strike needs to prepare for. Are you informed on current events such as information on possible floods or hurricanes? Am I in an evacuation zone? Is there a difference between the two types of zones and what are they? Do I have an emergency or hurricane kit? Am I prepared to evacuate if needed? Where will I (and my family) go? Do I have a communication plan to let relatives know where I will evacuate to? Do I or should I have flood insurance? The first action that everyone should take is to prepare and have a hurricane or disaster kit on hand. To find out what hurricane or disaster kit is and what goes into a kit besides food and water, check out FEMA at fema.gov, the National Hurricane Center at nhc.noaa.gov, or the Pinellas County Emergency Management Department at www.pinellascounty.org. Also, these sites and the State at floridadisaster.org and FLASH at flash.org can assist in helping to prepare your home to survive a hurricane. Another great site to help you, your family, and home prepare for a storm is FEMA’s “Ready” site, ready.gov. Secondly, everyone should prepare their home to withstand the possible damaging effects from a hurricane. High winds and flood waters are the two most common damaging effects from hurricane. [Against The Wind] The same sites that provide information on hurricane or disaster kits have information on how to protect your house and yard, and businesses from hurricanes. Third, everyone should know if they are in a flood zone and an evacuation zone. This information will help determine when and if you have to evacuate. A flood zone is different from an evacuation zone. Each is based on different information and is used for different purposes. A flood zone map is based on rising water created by a storm. This map is used to for flood insurance purposes. You can view the flood maps at the Library or at the Community Development Department or call (727) 893-1063 for flood map information. An evacuation map is based on flooding caused by rising water and wind driven waters. This type of flooding is more severe because it takes into account waves created by the storm which are on top of the rising flood waters. 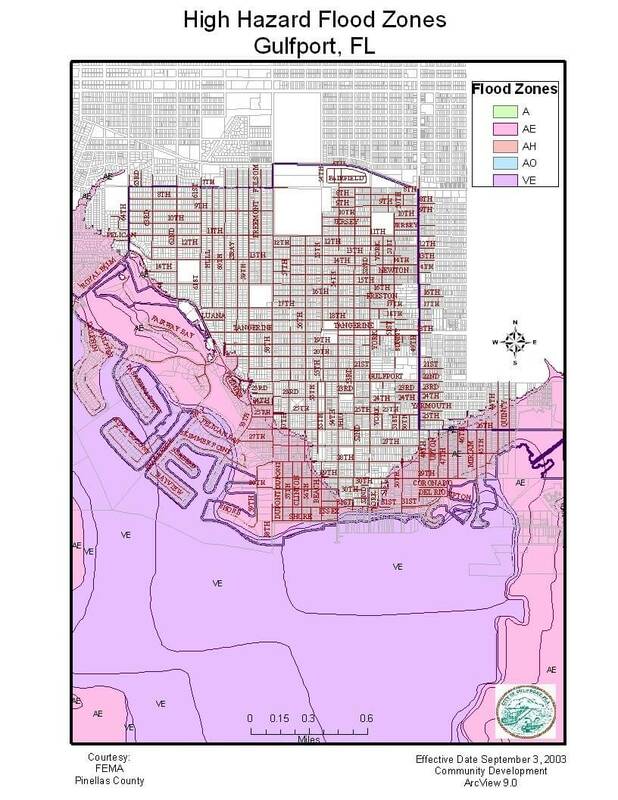 Evacuation maps are based on storm surge maps. Evacuation maps have increasing levels of evacuation based on the intensity and prediction of the storm. The evacuation levels range from “A” to “E” with “A” being the first level and “E” being the highest level of evacuation. Usually the “A” levels are those areas closest to bodies of water that are the sources of flooding. Pinellas County Emergency Management, pinellascounty.org, has evacuation information and can inform you of your evacuation level. Next, if you are in an evacuation zone, or decide to evacuate, where will you go? Where will you stay? You should basically know what you will do and where you will go at the beginning of the Hurricane Season. Then when the hurricane comes, you’ll be better prepared to evacuate. Usually the decision to evacuate depends upon the strength, position, and prediction of the major storm event. Based on the available information, a voluntary or mandatory evacuation is called. Then the evacuation process by an individual begins. Evacuation can be locally, like to a friend or relative’s home, or a hotel within the county. Many may evacuate to locations out of the county. Public shelters should be places of last resort to evacuate. If you evacuate, don’t forget to take your hurricane kit and let relatives know where you are evacuating to. Also be sure to include your pet(s) in your evacuation plans. After preparing yourself, your family, and your home from disasters like floods and hurricanes, what is your City doing to prepare and mitigate from disasters? Presently, the City of Gulfport adopts the countywide Local Mitigation Strategy (LMS) Plan for disaster and floodplain management planning. In addition to the flood mitigation, this Plan takes a countywide approach to reducing the impacts to residents from multiple types of natural and man-made hazards. Within the LMS document, the City has Appendix 15 that focuses on floodplain management that investigates specific areas subject to flooding, flood hazards, to assess problems, determine goals to reduce hazards from flooding, develop possible activities to implement, develop an appropriate action plan, and initiate an implementation plan. Monitoring and evaluating the LMS specific to Gulfport occurs annually. An annual evaluation and report is presented to City Council and made available for review at the Gulfport Public Library. Through flood mitigation planning, the City has made progress on projects designed to reduce flood damage. We have investigated the purchase of land that is low-lying and flood prone. The Public Works Department continues to improve the storm drainage system and maintenance procedures. The Building Division continues to update and enforce our floodplain and building codes. We coordinate with other local government agencies on flood projects, civil emergencies, and flood warning programs, including evacuations. You can find a variety of hazard mitigation information in the topics below. The following nine flood-related topics and flood hazard map are provided for information, protection, and action against flooding, and exposure or risk to flooding and flood hazards. We encourage everyone to read and do what they can to protect themselves and their property. The City of Gulfport is located on the shores of Boca Ciega Bay which is a major source of flooding in the City. The upland areas of Gulfport are characterized by flat terrain that slopes from an elevation of sea level to three feet in various locations along the waterfront to nearly forty feet in the northeast area of the City. The low lying and flat areas throughout the City are subject to freshwater flooding from street and yard runoff. Approximately one-third of the City is located within the 100-year floodplain mapped and adopted by the Federal Emergency Management Agency (FEMA). Since all of the high density condominiums within the City are located in the 100-year floodplain, most of Gulfport’s population is vulnerable and at risk of flooding. Therefore, being prepared for a storm or flooding conditions, which includes your residence, is vitally important. The flood hazard map, or Flood Insurance Rate Map (FIRM), included below was revised by FEMA and adopted by the City in 2003. The 100-year floodplain is where properties may experience flooding during 100-year and 500-year flood events and other major storms. Although the FIRM has a 2003 date, below is the most up-to-date flood map. Despite the significant improvements in Gulfport’s storm drainage systems throughout the city, freshwater flooding problems due to rainfall are still evident in the low lying sections of town. Causes contributing to the flooding include stormwater runoff created by an inadequate storm sewer system, and low ground elevations resulting in salt water flooding backing up through the storm sewer system from high tides of Boca Ciega Bay. Many times, rain will saturate the ground to a point where the ground will no longer absorb the water. With nowhere to go, the water will then add to the street, sidewalk and driveway runoff. Ponding of the water will begin to grow. Finally, the water will flood yards, encroach toward homes. If the rainfall is heavy or falls over a long period of time, the flood waters will enter homes. The FIRM’s that show local flood hazard areas within the City can be viewed at the Gulfport Municipal Library and at the Community Development Department in the City Hall Complex. Also, the Community Development Department has historic and current Flood Insurance Rate Maps for viewing and for map information purposes. If you choose to leave the County, know the major evacuation routes. The designated evacuation route to leave Pinellas County for the City of Gulfport is to travel eastward on Gulfport Boulevard South/22 Avenue South to I-275. Head north on I-275, crossing Tampa Bay on the Howard Franklin Bridge, and continue either northward on I-275/I-75 or eastward on I-4 to leave the region. An alternative route is to travel north on 49th Street South to 1st Avenue South. Turn right on 1st Avenue South and travel eastward to 20th Street South. Turn left and drive north to Interstate I-275. Continue either northward on I-275/I-75 or eastward on I-4 to leave the region. The following maps are the evacuation routes for Pinellas County. The first map illustrates the evacuation routes for south Pinellas County. The second map illustrates the regional evacuation routes which can assist in evacuations leaving Pinellas County. The map includes routes through Pasco and Hillsborough Counties. fema.gov – the Federal Emergency Management Agency, or FEMA, for preparation, planning, communication plans, emergency or hurricane kits, mitigation, and flood insurance. floridadisaster.org – the Florida Division of Emergency Management for family, home and business disaster mitigation preparation. nhc.noaa.gov – the National Hurricane Center for tropical weather information. noaa.gov – the National Oceanic and Atmospheric Administration for national and local weather alerts. floodsmart.gov – for information regarding flood insurance. pinellascounty.org – for evacuation level maps. ready.gov – for information regarding hurricane preparations. flash.org – the Federal Alliance for Safe Homes for information regarding strengthening homes and safeguarding families. For additional links for further information, please click FEMA Guide to Citizen Preparedness and Are You Ready. Residents are encouraged to call (727) 464-4333 for information throughout a storm threat. The Citizen Call Center is only activated during a storm threat. (727) 893-1000.